My son requested a Star Wars themed birthday party & of course, a coordinating cake was needed! I wanted to make the cake myself, but I am no cake decorating master so it was hard to find a design that wasn’t beyond my skill level. 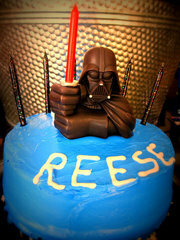 If you Google “Star Wars Cake” you will come up with some amazing ideas. Exactly zero which I could duplicate. So the next best thing was to Keep It Simple! I found an awesome Darth Vader candle holder on Amazon for about $5 (isn’t the red light saber candle adorable?). I made a mini-cake for my son in his favorite flavor & simply iced it blue. I added some black glitter candles I found at WalMart, wrote his name with icing in my quasi-Star Wars font, & he was so happy with how it turned out. I was glad that it didn’t take any skill to do this, & the results were still cute & kid-pleasing. Darth Vader’s head is shaped exactly like a bell…leave it to my Think-Outside-Of-The-Box Hubby to see that! 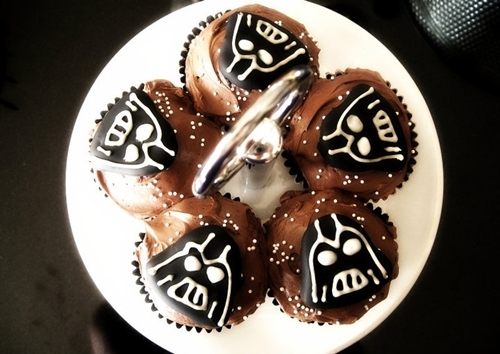 For the Darth Vader cupcakes, I used silver foil cupcake liners & baked some chocolate cupcakes. I frosted them with chocolate icing & added white nonpareils as stars for the background. Using a mini-cookie cutter in the shape of a bell, I cut out Darth Vader heads from sugar cookie dough. If your cookie cutter has a little “clacker” at the bottom of the bell, just cut it off. Once these were baked, I let them cool completely & it was time for icing. I made a batch of Royal Icing (recipe below) & colored about 2/3 of it black with gel coloring. I would recommend using gel for the best results. You can find food coloring gel in the Wilton cake decorating aisles of most stores (Wal Mart, Target, Hobby Lobby, etc). I thinned the black royal icing (1/2 tsp warm water at a time) until it was runny. Set cookie racks on cookie sheets or wax paper. Put the cookies on a cookie rack, then pour spoonfuls of black icing over each cookie, allowing the icing to run over the edges & onto the cookie sheet below. Repeat until all cookies are coated in black icing. Allow to dry before moving. Royal Icing turns hard as it dries, so once the black icing has set, I used the leftover white Royal Icing to pipe face details. You can pick up a small piping tip in the same Wilton aisle as the food color gel & a single tip is a few dollars. You could also use a freezer Ziplock bag and snip a small corner off, but your results will be a little harder to control. Just follow the photo above for the simple white face details. I would recommend making some extra cookies in case you flub the icing here or there…I know I did. Once the cookie icing was dry, I placed one on top of each cupcake. Easy peasy! Beat all ingredients until icing forms peaks. About 7-10 minutes using low speed in a heavy-duty mixer. About 10-12 minutes on high speed using hand mixer. For thinned royal icing, add 1/2 tsp. water at a time until icing is the consistency you want. My son loves Star Wars too. He would love the cakes! There are various ways in which Buy Play – Station network cards and the most convenient method of purchasing these cards is to buy them online. You can store files on the Internet, or run programs from there using specific sites that you have contracted with to perform these duties.